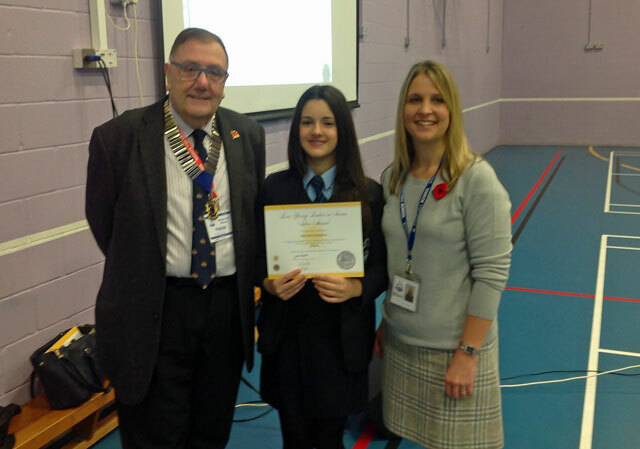 Photo shows Lion President Peter Bacon presenting Amery Hill School pupil Amelia Sanders with her Lions Young Leaders in Service Silver award accompanied by Mrs Joleen Riley, Assistant Head responsible for pastoral affairs. The award took place at the end of a week of presentations on volunteering and community service by Mrs Riley and Lion Derek Shaw to re-launch the Lions Young Leaders in Service scheme at Amery Hill school. Gold and Silver awards provide international recognition for voluntary service in the community and are seen as an extremely useful enhancement to CVs for employment and university applications.